The classic short nose is upturned and depressed (see the image below). More specifically, it is defined as a nose lacking dimension from the nasofrontal angle to the tip. A lack of tip projection often is implied in the diagnosis. 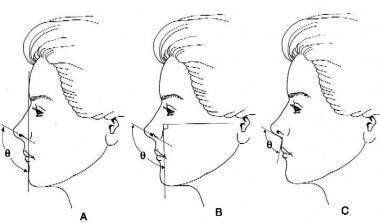 To determine if a short nose is present, a surgeon first must be aware of the dimensions of the normal nose. 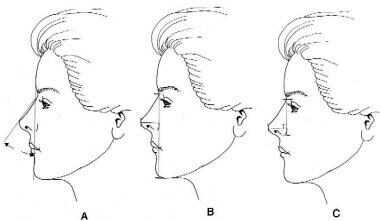 When identifying a short nose, analysis of the full face, particularly of the profile, is undertaken along with analysis of the nose in particular. Vertically, the face is divided into thirds (see the image below). The upper third extends from the hairline to the glabella, the middle third from the glabella to the subnasale (ie, the point where the columella strikes the lip), and the lower third from the subnasale to the menton (ie, the lowest point of the chin). Concept of facial thirds. The distance from the hairline to the glabella approximately should equal the distance from the glabella to the base of the nose. In turn, this distance should approximate the distance from the base of the nose to the lowest point on the chin. The root, or radix, of the nose is located where the nasal bones project from the frontal bone. In whites, this nasofrontal angle usually lies at the level of the superior tarsal crease (see the image below) with the eyes looking forward. At the radix, the nose projects beyond the supratarsal fold on lateral view. From this perspective, the distance from the canthal ligament to the nasion (ie, radix projection) should be about one fourth to one third of the nasal length. The dorsum of the nose usually extends in a straight line in a caudal direction from the nasofrontal angle to the tip. The supratip is the area just superior to the domes. Ideally, the supratip should have a slight depression (see the image below). Nasal length (NL) represents the distance from the nasal radix to the tip. Radix height (RH) measures the distance from the dorsum to the cornea on lateral view. 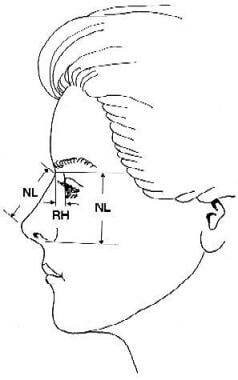 Nasal height (NH) measures the distance from the radix to the base of the nose. A saddle nose has a concave nasal dorsum. Saddle noses frequently are seen in conjunction with the short nose. At the supratip, the lateral crura diverge, which is seen on the frontal view. In this area, ligaments attach from the domes to the septal angle (ie, the intersection of the caudal and dorsal borders of the quadrilateral cartilage). Nasal length is defined as the distance between the nasofrontal angle and the nasal tip. 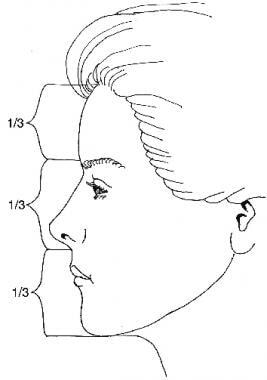 Nasal length should be two thirds to three fourths of the midfacial height and should approximate the height of the chin (see the image below). Nasal height is defined as the distance between the nasion and the subnasale. This distance is also approximately two thirds to three fourths of the midface height. Paradoxically, in the short nose with an upwardly rotated tip, nasal height may be perfectly normal. On anterior view, the border of the nasal dorsum should be evident as a smooth, gentle curve from the eyebrow through the glabella into the shadow line of the nasal dorsum and into the alar facial crease. Breakup of this line distorts the contour of the mid face. In the short nose, this line may be indistinct because of flattening of the dorsum. Although the nasal tip has several ideal qualities, the 2 most important qualities of the short nose, for purposes of discussion, are critical—tip projection and tip rotation. Projection refers to the distance the tip protrudes from the face. Several methods exist for evaluating this relationship, some of which may give an inaccurate reading if the nasal root is depressed or inferiorly displaced, if the maxillary teeth protrude, if the upper lip is too long or too short, or if the chin protrudes or recedes abnormally. Three methods are recommended: the nasofacial angle, the Crumley and Lanser method, and the Goode method (see the image below). Three of the best methods of analyzing projection: (A) the nasofacial angle, (B) the Crumley and Landser method, (C) the Goode method. The nasofacial angle measures the intercept of a line joining the glabella to the pogonion (ie, the most anterior point on the chin) with a line joining the nasion to the tip. The ideal angle varies according to practitioner, but it should be 30-40°. The Crumley and Lanser method analyzes the distance from the mandibular profile line (menton) to the nasion and measures projection to this line. The ratio of the length of the mandibular profile line to the projection distance should be between 4:1 and 4.5:1. The Goode method uses a vertical line from the nasion to the alar facial groove. A horizontal line is drawn through the tip perpendicular to this vertical line. The ratio of the horizontal line to the vertical line should be 0.55:0.60. 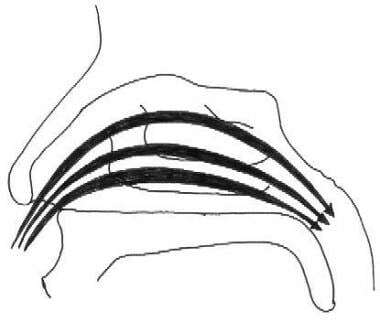 Rotation is measured as the angle of intersection between the facial plane (glabella to pogonion) and a line along the long axis of the nostril on lateral view (see the image below). The nasolabial angle differs from the columella-labial angle. The columella-labial angle is more obtuse when the caudal septum or nasal spine is prominent and more acute when the maxillary teeth protrude. Therefore, the nasolabial angle is more indicative of the true tilt of the nasal base. Determining rotation by passing a line perpendicular to the Frankfort horizontal, which passes through the alar facial groove, also is possible. This line is compared to a line that passes through the long axis of the nostrils. In females, the angle between the 2 lines should be approximately 95-105°. In males, this angle should be 90-95°. No more than a third of the vertical height of the nostril should be visible when the nose is viewed from the front. Three methods of analyzing tip rotation. Method A may be affected by chin position or a sloping forehead. Method C is inaccurate if the maxilla protrudes or if the columella is in an abnormal position. Method B is probably the most accurate, but it is difficult to employ on the operating table. Typically, the short nose displays various degrees of overrotation. On anterior view, one should have a foreshortened perspective of the nostrils. Too much nostril visibility indicates an upturned tip, a common finding in the short nose. When the tip is overrotated and the dorsum is flat, what is known as a porcine deformity results. A severe saddle nose may have lack of tip projection, a retracted columella, a bulbous lobule, a widened base, and apparent flattening and widening of the nasal bones. The short nose may be encountered as a variant of normal. Otherwise healthy people who have a depressed nasal root, an upturned nasal tip or a combination are not unusual. Such patients may seek correction for purely cosmetic reasons. The most common cause of the short nose is trauma. Severe frontal blows to the dorsum and tip cause the nasal bones to fracture and splay. The upper lateral and septal cartilages also fracture, buckle, and disrupt. Hematomas between the cartilage and perichondrium can cause cartilage death as the cells are robbed of their nutrient supply. Because the lower lateral cartilages have lost their cephalic support, nothing prevents upward rotation and deprojection of the tip. As the contractile forces of scarring proceed over the ensuing weeks after initial injury, the short nose deformity worsens. Problems with the lower lateral cartilage include loss of projection, flaring of the alae, widening of domes, rounding of the anterior nares and asymmetry. Cocaine and methamphetamine use also can cause short nose deformity. Septal perforations have been found in 4.8% of regular cocaine users. As a vasoconstrictive agent, cocaine promotes a localized rhinitis that leads to dryness, crusting, and bleeding. Focal necrosis of the perichondrium ensues and leads to exposure and death of chondrocytes. Eventually, the bulk of the septal cartilage is destroyed, causing collapse of the dorsum and upward rotation of the tip. Other infectious and inflammatory conditions may cause similar destruction. An undiagnosed septal hematoma may become infected, leading to destruction of the cartilaginous nasal skeleton. Rhinoscleroma, syphilis, and leprosy are less frequent infectious causes. Wegener's granulomatosis is an autoimmune disorder that is characterized by vasculitis, glomerulonephritis, and pneumonitis. The vasculitis may cause erosion and collapse of the nasal septum. Neoplasms (eg, esthesioneuroblastoma, inverting papilloma, squamous cell carcinoma) may result in the short nose deformity. Angiocentric immunoproliferative lesions represent another class of neoplasm that frequently destroys nasal tissue. These lesions are caused by a spectrum of entities known by various names, including polymorphic reticulosis, lymphomatoid granulomatosis, pseudolymphoma, lethal midline granuloma syndrome, nonhealing midline granuloma, and midline destructive granuloma. All of these entities may produce tissue destruction resulting in the short nose deformity. The nose warms and humidifies air by forcing approximately 2000 gallons of air per day in a narrow stream over a large surface area. The most efficient way for this airflow to occur is in a parabolic arc (see the image below). If the structure of the nose is altered through trauma or disease affecting the nasal septum or nasal valves, this normal airflow may be disrupted. The internal nasal valve is the main regulator of nasal airflow in whites. The normal flow of air through the nose should be laminar and parabolic. In the short nose, airflow typically breaks up into eddy currents, creating more resistance. The internal nasal valve consists of the caudal edge of the upper lateral cartilage, the cephalic margin of the lateral crus laterally, and the nasal septum medially. The angle between the septum and the upper lateral cartilage should be at least 10°. If the angle is smaller, airway obstruction and a loss of sensation of airflow are likely to result. The patient with a short nose may have obstruction, scarring, and displacement of the internal nasal valves. With nasal blockage, turbulence increases, and eddy currents form. This results in localized drying of the nasal membranes, causing crusting and epistaxis. Obtain a careful history to exclude untreated ongoing causes of the short nose deformity. Carefully question the patient for past medical history of neoplastic, infectious, or autoimmune disorders, medication and illicit drug use, and prior surgery and trauma. A family history may be helpful in diagnosing conditions such as Binder syndrome. On physical examination, take note of the quality of the skin, the integrity of the underlying cartilages and bone, and the condition of the septum. Although sometimes difficult, the surgeon should try to assess the amount of septal cartilage available for grafting material and anticipate the need for auricular grafts, rib grafts, or alloplastic materials. Short nose rhinoplasty is indicated for cosmetic or functional reasons for patients who are considered good surgical candidates. Functional indications for short nose rhinoplasty include difficulty breathing through one or both nostrils, nasal bleeding, crusting, dryness, infection, or pain. Cosmetic indications include a tip that is retracted or upturned, with or without collapse of the nasal dorsum. The bony skeleton of the radix and dorsum consists of the paired maxillary and nasal bones. From the anterior view, the bony nasal opening has the appearance of a pear, hence the name pyriform aperture. The cartilaginous framework provides support for the lower dorsum and nasal tip. The septal (ie, quadrilateral) cartilage adjoins the perpendicular plate of the ethmoid, the vomer, and the maxillary crest. At the most anterior portion of the nasal floor, the paired maxillary bones give rise to the nasal spine, upon which the caudal septum rests. The septal angle is the point where the dorsal and caudal borders of the septum intersect, and it is a critical landmark for determining the position of the nasal tip. The keystone, or K area, is where the nasal bones overlap the septal cartilage near the superior borders of the upper lateral cartilage. The septal cartilage, perpendicular plate of the ethmoid, paired nasal bones, and paired upper lateral cartilages meet at this critical area. Disruption of the septum during trauma most often occurs in the keystone area, possibly resulting in saddle-type deformities. The upper lateral cartilages slightly underlie the caudal edge of the nasal bones superiorly, and they turn upward at their caudal end to form a scroll that approximates the cephalic end of the lower lateral cartilages. Laterally, little soft tissue support is present between the pyriform aperture and the upper lateral cartilage. The lower lateral cartilage consists of a medial crus and a lateral crus. The medial crus joins the lateral crus at the dome. In the clinical setting, the size, shape, position, and strength of the lower lateral cartilages define tip projection and rotation. Other major tip support mechanisms include the attachment of the medial crural footplates to the caudal septum and the attachment of lateral crura to the upper lateral cartilages. Minor tip support mechanisms include the strength of the dorsal septum, the interdomal ligaments, the membranous septum, the nasal spine, the skin–soft tissue envelope, and the lateral crural attachments to the pyriform aperture. The skin of the nose varies greatly among individuals. However, in general, the skin is thickest over the glabella and nasal tip and thinnest over the dorsum. Skin thickness plays an instrumental role in the ability of the soft tissues to drape properly over the altered nasal skeleton. 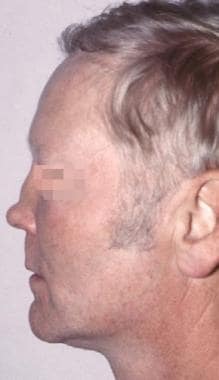 In many patients with a short nose, the skin is thick, scarred, taut, and deficient. Short nose rhinoplasty is contraindicated in patients who have surgical risks from a physiologic standpoint. Psychological or emotional instability also should exclude prospective candidates. This type of operation is not recommended for patients who have undergone high-dose radiation therapy to the face or have facial burns involving nasal skin. Lack of available donor tissue argues against surgery. Treat active infectious, neoplastic, or autoimmune diseases before considering surgery. A history of multiple previous rhinoplasties is a relative contraindication. Lee HJ, Jang YJ. Correction of saddle and short noses. Curr Opin Otolaryngol Head Neck Surg. 2016 Aug. 24 (4):294-9. [Medline]. Aiach G, Monaghan P. Treatment of over-reduction of the nose and subsequent deformities. Br J Oral Maxillofac Surg. 1995 Aug. 33(4):250-61. [Medline]. Ahn JM. The current trend in augmentation rhinoplasty. Facial Plast Surg. 2006 Feb. 22(1):61-9. [Medline]. Lan MY, Jang YJ. Revision Rhinoplasty for Short Noses in the Asian Population. JAMA Facial Plast Surg. 2015 Sep 1. 17 (5):325-32. [Medline]. Swanepoel PF, Fysh R. Laminated dorsal beam graft to eliminate postoperative twisting complications. Arch Facial Plast Surg. 2007 Jul-Aug. 9(4):285-9. [Medline]. Kim L, Papel ID. Spreader Grafts in Functional Rhinoplasty. Facial Plast Surg. 2016 Feb. 32 (1):29-35. [Medline]. Lee SH, Koo MG, Kang ET. Septal Cartilage/Ethmoid Bone Composite Graft: A New and Improved Method for the Correction Underdeveloped Nasal Septum in Patients with Short Noses. Aesthetic Plast Surg. 2017 Apr. 41 (2):388-394. [Medline]. Mutaf M. The anatomic replication technique (ART). A new approach to saddle nose correction. Ann Plast Surg. August 2008. 61(2):169-177. Christophel JJ, Hilger PA. Osseocartilaginous rib graft rhinoplasty: a stable, predictable technique for major dorsal reconstruction. Arch Facial Plast Surg. 2011 Mar-Apr. 13(2):78-83. [Medline]. Park JH, Mangoba DC, Mun SJ, Kim DW, Jin HR. Lengthening the short nose in Asians: key maneuvers and surgical results. JAMA Facial Plast Surg. 2013 Nov-Dec. 15 (6):439-47. [Medline]. Woo JS, Dung NP, Suh MK. A Novel Technique for Short Nose Correction: Hybrid Septal Extension Graft. J Craniofac Surg. 2016 Jan. 27 (1):e44-8. [Medline]. Kim SK, Kim HS. Secondary Asian rhinoplasty: lengthening the short nose. Aesthet Surg J. 2013 Mar. 33 (3):353-62. [Medline]. Burke AJC, Wang TD, Cook TA. Irradiated homograft rib cartilage in facial reconstruction. Arch Facial Plast Surg. Setpember/October 2004. 6:334-341. Kridel RWH, Ashoori F, Liu E, Hart CG. Long-term use and follow-up of irradiated homologous costal cartilage grafts in the nose. Arch Facial Plast Surg. November/December 2009. 11(6):378-394. Menger DJ, Nolst Trenité GJ. Irradiated homologous rib grafts in nasal reconstruction. Arch Facial Plast Surg. 2010 Mar-Apr. 12(2):114-8. [Medline]. Clark RP, Wong G, Johnson LM, et al. Nasal dorsal augmentation with freeze-dried allograft bone. Plast Reconstr Surg. 2009 Oct. 124(4):1312-25. [Medline]. Wang TD. Gore-Tex nasal augmentation: a 26-year perspective. Arch Facial Plast Surg. 2011 Mar-Apr. 13(2):129-30. [Medline]. Becker H. Nasal augmentation with calcium hydroxylapatite in a carrier-based gel. Plast Reconstr Surg. June, 2008. 121(6):2142-2147. Davis RE, Wayne I. Rhinoplasty and the nasal SMAS augmentation graft: advantages and indications. Arch Facial Plast Surg. 2004 Mar-Apr. 6(2):124-32. [Medline]. Gruber RP, Pardun J, Wall S. Grafting the nasal dorsum with tandem ear cartilage. Plast Reconstr Surg. 2003 Sep 15. 112(4):1110-22; discussion 1123-4. [Medline]. Riechelmann H, Rettinger G. Three-step reconstruction of complex saddle nose deformities. Arch Otolaryngol Head Neck Surg. 2004 Mar. 130(3):334-8. [Medline]. Yabe T, Muraoka M. Treatment of saddle type nasal fracture using Kirschner wire fixation of nasal septum. Ann Plast Surg. 2004 Jul. 53(1):89-92. [Medline]. Demonstration of the nasal tripod concept. As with a tripod, if the lateral legs (lateral crura) of the nasal tip are shortened, the tip rotates upward. Upward rotation also occurs if the central leg (conjoined medial crura) is lengthened. Downward rotation occurs if the opposite maneuvers are carried out. Projection is altered by increasing or decreasing the lengths of all the legs concomitantly. With most short noses, the goal is to derotate the tip, and many operations attempt to lengthen the lateral legs of the tripod. The columellar strut. This is a common way to restore or increase tip projection, which is typically deficient in the short nose. One method of lengthening the lateral legs of the tripod is to insert cartilage or composite grafts into the area illustrated. This should derotate the tip and increase projection. Use of interlocking calvarial bones to restore integrity of the collapsed nose. The dorsal strut is secured with screw(s) to the native bony dorsum. The caudal strut fits in a slot drilled in the dorsal strut. A small screw in the caudal strut acts as a stop to prevent retrodisplacement of either strut. Two pieces of calvarial bone. One will be fashioned to serve as the caudal strut and the other as the dorsal strut. Large permanent suture to anchor the dorsal bone strut to the periosteum around the nasal spine. Dorsal strut in place. This will be modified to allow for the proper nasal tip projection.